One of the most popular methods of motivating children when potty training is to use a potty training sticker chart. Our potty training sticker charts (for boys or for girls) come with 126 shiny high gloss potty training stickers designed to last until potty training is completed. This method of using a potty training sticker chart has been effectively used to expedite the potty training process. MOM Designed / CHILD Approved! Motivate and reward your child using full color stickers. After successful potty attempts place a sticker on your child’s shirt or use the chart provided. The chart and the stickers were exactly what we needed to get us going. My daughter actually preferred to wear the reward sticker, and we kept track by drawing smiley faces on the chart. 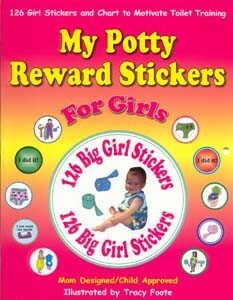 My Potty Reward Stickers for Girls was a very positive motivation for her. She was almost fully potty trained within about 10 days or so. I only have her wear a pullup at night ‘just in case’. First time my 3 yr old daughter has been excited to use the potty!! little patience is all a parent needs for a postive potty training experience. Although my 2 1/2 year old daughter has never actually used the potty for anything other than a reading chair, she is very aware of what it is for. I have been at wit’s end trying to find reasons for her to try to use her stool (other than the obvious) and didn’t want to bend to the whole bribery thing for fear it would get out-of-control. Enter the potty training sticker chart rewards book which is actually a booklet with 14 columns of 9 spaces to put a sticker every time your child has a potty accomplishment. Since my daughter isn’t really interested in ditching diapers yet, I haven’t pressured her, but at least now she is telling me when she has dirtied herself and is willing to try to use it for it’s intended purpose. She is thrilled to put a sticker on the page every time she sits on her potty, and I have told her that she will win a prize for every row she completes on the potty training sticker chart after having actually gone to the bathroom. I think she’s starting to get the idea! Potty training girls seems to be a little easier than boys, but if your child is nervous or stubborn, it can still be a challenge. Here are some of more of our favorite items for making potty training fun for girls. If you have not purchased your potty. Create some excitement for your little girl by using this musical potty to teach cause and effect. While you can use a stuffed animal, there is nothing like using a little girl doll that your own little girl will relate to. We have chosed two types of dolls for potty training girls that are currently the best in the market. Have a special book that is only read while sitting on the potty. This book has very cute drawings. making it a very friendly book.